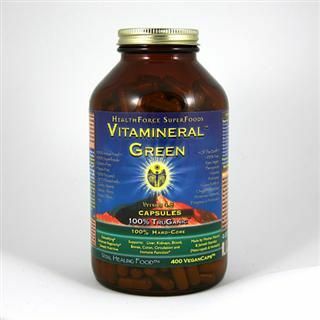 Vitamineral Green from HealthForce Nutritionals is a probiotic powder with enhanced bioavailability of essential organisms. It contains a combination of potent cleansing superfoods, which have been grown and processed to maximize their benefits. Vitamineral Green's extremely nutrient dense formula helps support vital body systems, such as the liver, kidneys, and immune system. Vitamineral Green contains naturally occurring, easily absorbable vitamins and minerals to aid in the development of strong bones. Essential amino acids contribute to healthy cellular systems. Other phytonutrients and synergistically bound organic nutrients contribute to the overall health and well-being of the body. Vegetable extracts provide fiber which helps maintain a healthy colon, cleansing and detoxifying the urinary tract. Improving regularity and overall digestive system health. Comprehensive Probiotic Mixture - Beneficial Organisms. Includes Exclusive NSO (Natural Soil Organisms) and Implantable Species. A. Agilis, L. Acidophilus, R. Arrhizus, DDS-1 Acidophilus, Bifidus, L. Bulgaricus, A. Brasilienese, B. Brenis, P. Chrysosporium, A. Citreus, L. Casei, P. Calcis, S. Cellulasae, P. Denitrificans, S. Faecium, S. Fradiae, P. Flourescens, A. Globiformis, S. Griseoflavus, P. Gelatic, B. Lipolyticum, A. Luteus, A. Lipoferum, A. Lwolfii, B. Laterosporous, P. Marinoglutinosa, , B. Macerans, P. Nigraclens, P. Putida, L. Plantarum, B. Pumilus, B. Polymyxa, B. Stationis, L. Salivarius, B. Subtilus, B. Succinogenes, A. Simplex, B. Subtilus, S. Thermopolis , A. Terreus, M. Verrucaria, T. Viride. , K. Zopfit. I have been using The Vitamineral Green now for 3 months and I LOVE IT! I add this to juice or when I make a smoothie I will add it to that. It has so many nutrients and cleanses in it that I really feel refreshed and energized with this product. If I go without it for a few days I really start feel sluggish, I have found that this product is really my best supplement to take for overall health benefits. I love this product, it is so full of healthy nutrients that your body can use. I put a tablespoon in my protein shake every day along with strawberries, blueberries flax and chia seed. I also put in shake Healthforce Acerola powder and there spirulina powder.I have really noticed the difference it really keeps me going. I've been using this product for nearly 17 years and have found it to be an excellent product for maintaining good general health. 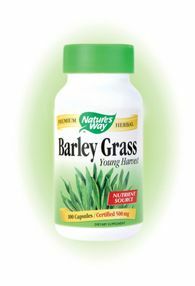 I was first introduced to this product while looking for a "green" supplement in a local health food store. After viewing several option I spoke with the stores supplement manager, he told me that if he could take only one product from the store HealthForce Vitamineral Green would be his choice. You can pay less but you would find better "greens"
This is an outstanding product. 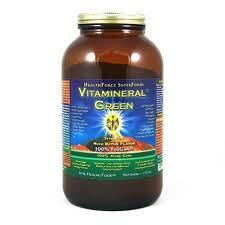 I have been using it for about 15 years now, if I could take only one supplement Vitamineral Green would be it. I use this product daily, especially during times of fasting and cleansing. I mix bee pollen and chia seeds and have that as a meal. It is so full of bio-energized nutrient dense superfoods, that I am never lacking for energy. By body craves this stuff. I've tried many different green powders, but nothing compares. I have been using this product for over 10 years. If I could use only one health product this would be the one. I use it a part of a breakfast drink, it blends easy and the taste does not overpower the drink. I have tried many green superfoods, and this one is the best!!! I eat it by the spoonful right out of the jar. It can be added to green smoothies or juices to boost the nutrient content. All of the Healthforce products are top notch, especially for raw vegans like I am. 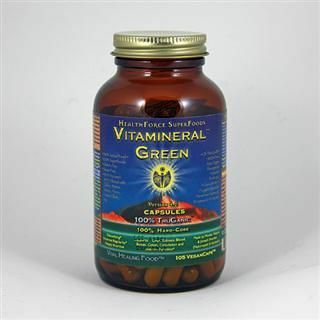 I\'ve been using Vitamineral Green everyday for over a year and it has greatly improved my health. I've been using Vitamineral Green for two years--a scoop a day in a smoothie along with banana, fruit juice and hemp protein powder. This has been a big help to insure that I get adequate nutrients for the day, especially since meals are usually small. I'm 60, rely on a bike for most errands, and find that this product helps keep the body fit and energized. Tastes great and the ingredient list (including digestive enzymes, probiotics and wheat and barley grass - which I do not enjoy the taste of) is full of health promoting whole raw foods! I noticed improved digestive function within 3 days.